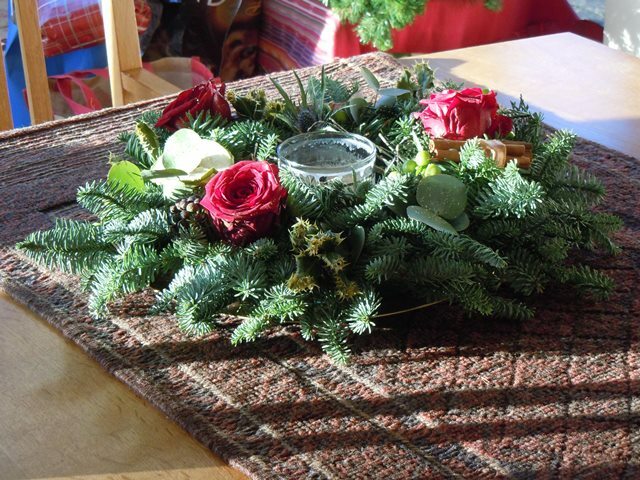 I had an enjoyable evening making the wreath for the door, but decided it made a better table decoration. And to you and yours Ara. Yes, it is and I’m starting to panic slightly. We are doing the whole Christmas thing on Christmas Eve this year because Daughter Number 1 and family are spending Christmas Day with his parents. That’s what I always think. Once Christmas is over, I cheerfully ignore all the bad weather because the evenings are getting lighter and Spring is just around the corner. This is the fulcrum of the year…..
I’ve passed into the bah humbug stage already! The NSW is on duty Christmas Eve and Day so I can’t open my prezzies until Boxing Day. Sob! Still, I’ve got all of 25th to prep Christmas Lunch and we’ll have a lovely day on 26th. If the weather stays like it is we shall be dining on the terrace.. Happy Christmas to you and yours, Pseu. On the terrace, OZ? May you be forgiven! 48 hours without shops? Crikey! Compliments of the season to fellow Charioteers.